LapPi – A Raspberry Pi Netbook #piday #raspberrypi @Raspberry_Pi « Adafruit Industries – Makers, hackers, artists, designers and engineers! The Raspberry Pi is a remarkable machine. Lightweight, powerful, and until now it was completely tethered to a wall socket. The LapPi is built to free the Pi! It’s made from a mixture of spare parts, unallocated electronics, and scrapped components & cables I have built it in response to the Raspberry Pi Challenge. The challenge was picked up on the 15th of October via retweet from @raspberry_pi, and by the end of the day I knew what I wanted to do…. The basic idea is simple. 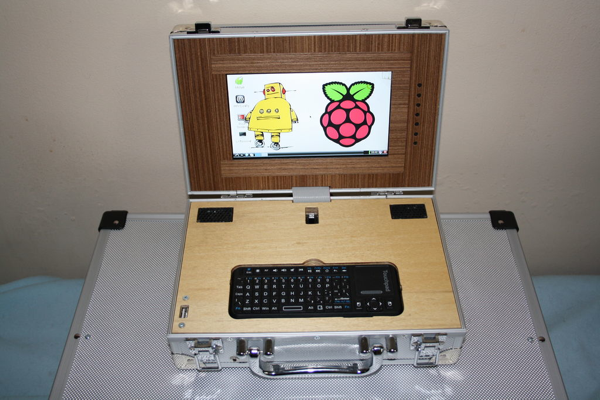 Put a Raspberry Pi inside an aluminum case, wire it up to a screen, keyboard, mouse & batteries. Then plug in a USB hub, connect Wifi, Bluetooth, and the receiver for a wireless keyboard. We will also need to extend the Network port, add a headphone socket & speakers, fit in a battery pack, and then wire it all together! Simples.